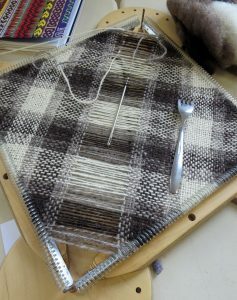 Ann had organised a day for sampling various weaving methods. Members brought a wide variety of gadgets and examples of their skill. 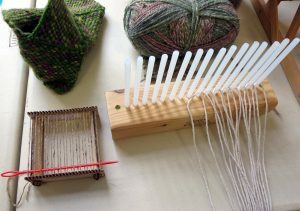 From tapestry, to toy and tablet there was a wide range of looms and techniques to try. 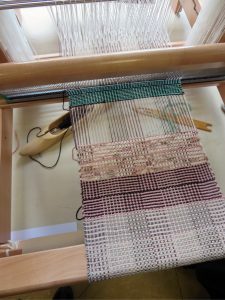 When you attempt to list the different methods that may be classified as ‘weaving’ they are many and various. 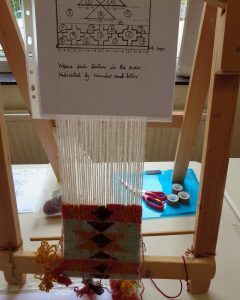 Simple weaving on cards that we did at school through to Chas’s exquisite tablet weaving with cards. 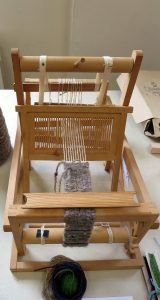 Weaving on sticks, round pegs or pins from simple inkle and box looms to elegant, portable four and eight shafters. Is it weaving or is it braiding? Are braids, bands, or narrow wares part of the same broad family of interlocking threads? 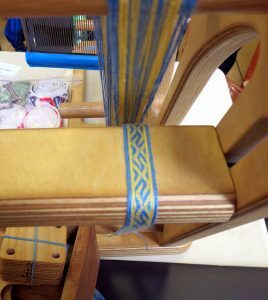 As well as a traditional Japanese ‘dai’ beautiful braids/bands may be constructed on a simple cards or polyurethane plates and discs. Welcome also to the Exhibition Committee members who had travelled from the Cheshire, Merseyside, Alsager, Leek and Shropshire Guilds and the Online Guild.